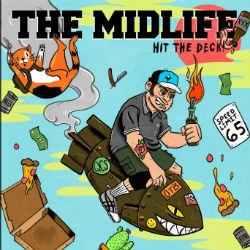 Springfield, MO’s punk band The Midlife have announced the release of their first full-length album! According to their Bandcamp page, the new LP Hit The Deck is scheduled for a September 23 release. The album is the follow-up to their 2016 self-titled EP. You can pre-order the album now on their Bandcamp page. I recently had a chance to talk to the guys in the band to get the story about their band, their music and some other random nonsense. Formed in 2014, Turnspit is a Chicago-based pop-punk outfit that recently released their LP Desire Paths on February 16 via Dodgeball Records. I recently had a chance to speak with Gillian McGhee (singer/guitarist) from the band. We discussed the band in general, their influences, the meaning behind some of the songs on the album and what drives her personally. This Obsession is a pop-punk band based out of Chicago, Illinois. The band was recently signed to Wiretap Records. Their newest album, A Confrontational Effort, was released today (March 16). I recently had a chance to talk with Mark and Jess from the band. We talked about the band’s history, their music, their involvement with Wiretap, and life in general. EDITORS NOTE: This is an interview that Dave (Oklahoma Lefty) did with Aree of Aree and the Pure Heart back in 2015. Aree and the Pure Heart just recently signed with Wiretap Records so I thought now would be a good time to re-publish it. Aree and the Pure Heart’s debut EP Heartsongs is nothing short of brilliant. Every so often you come across a band that has never been on your radar and makes you feel like you have been living under a rock. If that is you, it’s time to crawl out from under that rock and check out Harker. Harker is a band based out of Brighton, England that is releasing their debut full length No Discordance next month on WireTap Records. It will be available on February 9 on digital, vinyl and CD formats. The lead single, “300 Cigarettes” was released in November and was followed by a short tour of the UK. Voice of Addiction is a Chicago-based, politically charged punk rock band that started in 2004. They have toured extensively and recently released their 4th full-length album, The Lost Art of Empathy on Wrecking Ball Productions. The bottom end of Voice of Addiction is held down by Ian JohnnyX, who is also the singer and creative force behind the band. In this interview, we discussed the band in general, the creative/writing process, his bass playing and influences, and even a little politics. One of the hottest bands to come out of the Oklahoma City area in the past year is Don’t Make Ghosts. Made up of former members of punk rock band The Roustabouts, DMG blasted into the scene with their debut EP Death Ride have been blowing up the local scene, even securing a slot at Florida’s The Fest this year. Holding down the bottom end of this prodigious unit is Dirk Mathews. Here’s an interview with a bass player! For our interview, the spotlight goes to Dave Klein. Dave hails from Edmond, Oklahoma and has played for bands such as Wretch Like Me, Screeching Weasel and Black Flag, among many others. A band that has recently caught my attention is Droids Attack. DA is a rock band from Madison, Wisconsin. They began in the early 2000s and have released 4 full length albums since their inception. In 2004, the band won a MAMA (Madison Area Music Award) for best punk album with All Your Chicks Are Belong To Us. They released their latest full length Sci Fi or Die in February 2016 and are about to embark on a summer tour of the United States. I had a chance to talk to their singer and guitar player Brad Van and conducted this interview via email.